The player controls Norville "Shaggy" Rogers as well as Scooby Doo simultaneously (he automatically mimics any movements that the player makes as Shaggy) making gameplay unique. The object of the game is to find clues to solve the 4 mysteries in the game. These clues can be obtained by finding them in the open, completing a specific task, or having Scooby "sniff out" hidden clues in each area. These clues give the players Mystery points and more points can be earned in the bonus levels. If the player accumulates 10,000 points, they will receive an extra life. In addition, the player must avoid hazards such as small creatures, falls from high areas, or the level Monster. Each of these will add to the players "Fright Meter" which, if full, will result in the player losing a life. Once enough clues have been gathered, Velma will send you to Fred to help him build a trap to catch the monster. The player then has to lure the monster to the trap before the end of level cutscene plays. At the beginning of each level, only a small portion will be accessible, but as more clues are found, more of the level can be explored. 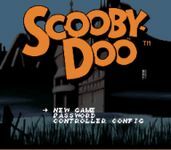 Between each case, a game clip of the Mystery Machine driving along with on-screen dialogue from the gang inside is shown. The mysteries themselves don't have much plot before or after each case, and the person in the monster suit is usually never met until they are unmasked. Spooky Shipwreck - This is the Red Ryan which is being haunted by a ghostly pirate named One-Eyed Matt. He is actually after treasure on sunken ships nearby which he planned to melt down and steal . Haunted Amusement Park - The Fun Fair is being haunted by an Evil Clown who seeks to close the park as revenge for being fired when he was the parks janitor. Abandoned Ranch - The Tar Monster is scaring everyone away from this ranch in order to buy the land cheap and then sell it at a profit due to it containing valuable minerals. Haunted House - A house belonging to Daphne's Uncle which is being haunted by a vampire named Count Bagosi. He is trying to scare everyone away to protect his illegal counterfeiting operation. Source: Wikipedia, "Scooby-Doo Mystery", available under the CC-BY-SA License.